Many sites, like Ask Ubuntu and Sharepoint also have predominantly white logos in oneboxes. These images should have a background colour, so that they are visible. chat.stackoverflow.com has a slightly off-white background, so the white content is still slightly visible. 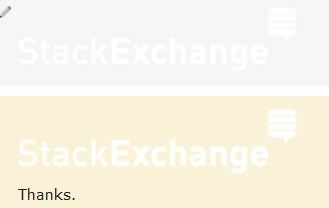 chat.stackexchange has a pure-white background, white content is gone. Browse other questions tagged bug chat design onebox . Can we change how UX.SE appears in the chat rooms?